Enter today the Dollar General Scratch & Win Game at dgscratchandwin.com for your chance to win the $250,000 grand prize, 1 of 5 $25,000 cash prizes, 1 of 15 $5,000 cash prizes or 1 of 1,000 $100 Dollar General Gift Cards and more! get more info at http://dgscratchandwin.com. 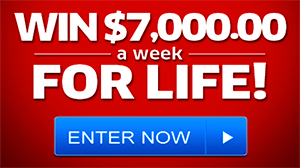 Once you have obtained an Entry Code, you must logon to DGScratchandWin.com the official website and submit your Entry Code and your valid e-mail address. EaSY! Grand Prize Winner will receive Two Hundred Fifty Thousand Dollars ($250,000) awarded in the form of a check made payable to the Grand Prize Winner. First Prize Winners will each receive Twenty Five Thousand Dollars ($25,000) awarded in the form of a check made payable to the First Prize Winner. Second Prize Winners will each receive Five Thousand Dollars ($5,000) awarded in the form of a check made payable to the Second Prize Winner. Third Prize Winners will each receive a $100 Dollar General Gift Card. Shop at the Dollar store in Johnstown quite often . Dollar General in Oxford Indiana is a great store and nice employees. Great asset to the community.!!!! 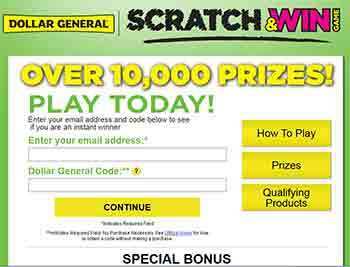 I like the store but the “www.DGScratchandWin.com” website needs some work. I`ve only been able to play the game once, otherwise it`s surveys, surveys, surveys. Besides, if it`s supposed to be free to play, then why do I have to purchase anything? Always a catch. You can’t enter to win anything without doing some kind of survey. I love Dollar General because they are great contributors to the community. I love Dollar General for the awesome prices too!!!! THANK YOU DOLLAR GENERAL FOR BEING THE NUMBER ONE STORE IN MY COMMUNITY!!!! KEEP UP THE GOOD WORK!!!! I so love Dollar General. I always go in to buy 2 or 3 things and end up leaving the store with 3-6 bags (way more than the 1 bag I would have gotten if I went there to get what I needed) very addictive and super low prices. Gonna have to check myself into rehab if this store keep giving away their items at those prices.